Beijing and London-based artist Helen Couchman talks about her latest work, “In Beijing” showing at Amilal until August 24. Can you explain a bit about what fascinates you about land in Beijing, and land in general? I came the Beijing for a couple of reasons. The main one being rapid changes to the country I infrequently heard stories about. It was extraordinary to hear tales about the dams, cities and industry being built and to have a tiny taste of the millions of lives this affected. I had been working on themes about land use, changing landscapes, the politics and economics evident in our use of land for many years in various places such as Cyprus, Armenia, America and England—China looked like a similarly inspiring place. How did the idea for your current exhibition develop? Sometimes some of my ideas burn a hole in my mind, reoccurring and developing until I have to try them out visually. This was one of those ideas. And it played into other thoughts I was having, connecting very well with work I’ve been making over the last couple of years. Where were you taking the pictures? I was taking pictures around the old historic Bell and Drum Towers Square. It is the latest area of the old city to be the focus of the developer’s wrecking ball. The pretty hutong lanes on one side of my makeshift path, and the earth, blue fences and open spaces on the other proved of interest; it was a chance to see the earth under the place, to see something missing and to be reminded of what lanes are built upon. I returned a number of times last year to walk around and look at what is happening there. Your feet appear in these photos. Can you discuss why? I like the way they remind me of the scale of the work and that the work is all on the ground. They act as a reminder that everything not reflected here is maybe not much more than a foot from the ground. The feet also reminded me of what it feels like to stand on the ground and savor the textures and the dirt, as this work has a performative aspect, and I want the process to be evident. What do you hope to express to viewers of this exhibition? I want viewers to leave the exhibition discussing what they have seen and what they know about Earth and how we cover it, build on it and rely on it. I’d like to think that the combination of earth and sky (near and far) in the images reminds us of what we build in between and why. Why mirrors? And where did you find them? 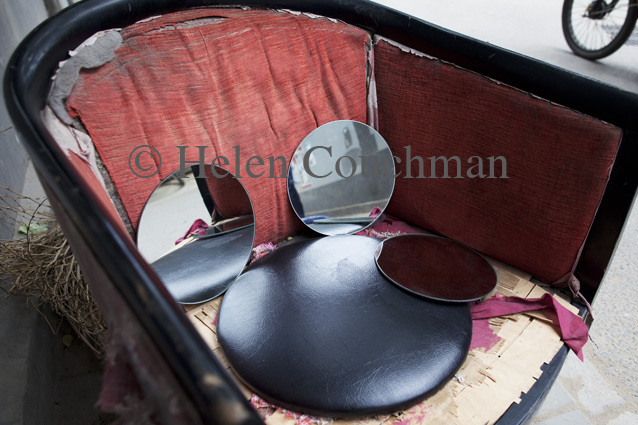 The mirrors were amongst a box of household odds and ends I was given when a friend relocated out of Beijing. They have been sitting on my desk some 18 months waiting for me to act upon them. I kept looking at them and making experiments with them until I finally could not put it off any longer. Any plans to take this exhibition on the road? I planned to exhibit the work in London this September but sadly that opportunity fell though as someone dear to the curator has taken very ill, and so understandably it is cancelled. But there are people who are curious about the show, so there may be another chance to show the series in the future. I find the artist’s strategy of placing her feet into the photograph to mark scale and “savor the textures” to be a tremendously compelling one. There seems to be a lot going on here. Is it possible to post more photos? Let’s hope the curator’s friend gets better soon so that this work can exhibit in London!